confuse them. They sometimes refer to all three as the big bang or as evolution. Scientists find this annoying since they are three quite distinct fields of study. It is like confusing history with chemistry. This essay will focus on abiogenesis. The creationists insist that all the species on earth from paramecia to rabbits poofed into existence fully formed when a sky wizard waved his magic wand. They imagine science’s view is similar, except there is no wizard. Nothing anywhere near as dramatic happened. After 3 billion years of effort, all abiogenesis had to show for itself was an RNA (Ribonucleic acid) molecule even more primitive than a virus. 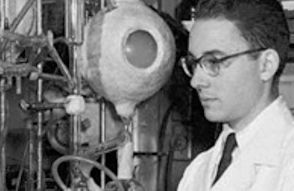 Way back in 1953, Stanley Miller did an experiment. He sent an electrical charge through a flask of a chemical solution of methane, ammonia, hydrogen and water. This created organic compounds including amino acids. This astounded everyone. In one day nature had got &frac13; of the way to creating primitive life. What had to happen next was the creation of nucleotides which are similar to amino acids, then linking them into chains of RNA. We do this every day in the lab when weu synthesise DNA (Deoxyribonucleic Acid). The puzzle is why nature took so long to stumble onto the same chemistry. I exaggerate, but it is bit like nature taking 3 billion years to discover rusting. On 2017-03-01 scientists announced the discovery of new fossils, that look like filaments, almost as old as the age of the earth. This suggests that life started almost the instant the rock cooled. This suggests it might have been seeded from elsewhere, such as Mars. This discovery needs to be confirmed. Abiogenesis is not about biology. It is about organic chemistry — the formation of the chemical precursors to life. Evolution takes it from there, explaining the complexity of creatures. Most people would not even consider the crowning achievement of abiogenesis alive. It was not even as sophisticated as a virus. It was the barest minimum from which life could jump start.